All university maps, directions and buildings can be located here. 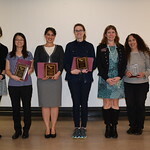 Each year Women in Science and Engineering (WISE) sponsors an awards program that recognizes the research and mentoring efforts of women on the Texas A&M campus. These awards are offered in honor and remembrance of Ethel Ashworth-Tsutsui, a long time member of the faculty of the Biochemistry Department here at Texas A&M University. Dr. Tsutsui was a founding member of WISE and cared deeply about the retention and recognition of women in our graduate programs. Women graduate students are invited to apply for these awards. Faculty members are encouraged to nominate deserving individuals. Dr. Grunlan will present the lecture on February 8, 2018. Awards recipients will be recognized after the lecture. is an organization of graduate students, staff and faculty from various science and engineering backgrounds. The group was created to address specific problems faced by women in non-traditional fields. For more information about the lecture or other outreach events and women's programs in the College of Science, please contact Nancy Magnussen at (979) 845-5587 or nancy@science.tamu.edu. Established to honor women graduate students who have demonstrated excellence in research. Nominees must be women graduate students currently enrolled in a graduate program at Texas A&M University. They must have completed at least two semesters of graduate study at Texas A&M University and be enrolled for at least six semester credit hours during the semester in which they are nominated. Nominations may be made by the candidate or by a Texas A&M University faculty member. Award recipients will receive a $500 monetary award, certificate and plaque. Established to honor women graduate students, postdoctoral researchers and research staff who take action to encourage and support women graduate students at A&M University. Graduate student nominees must have completed at least two semesters at Texas A&M University and currently be enrolled. Nominations may be made by a peer or by a Texas A&M faculty member. Award recipient will receive a $500 monetary award, certificate and plaque.